One school and three professionals have been selected as finalists for the Vision Pioneer Awards, recognising their vital work with children and young people who have vision impairment. 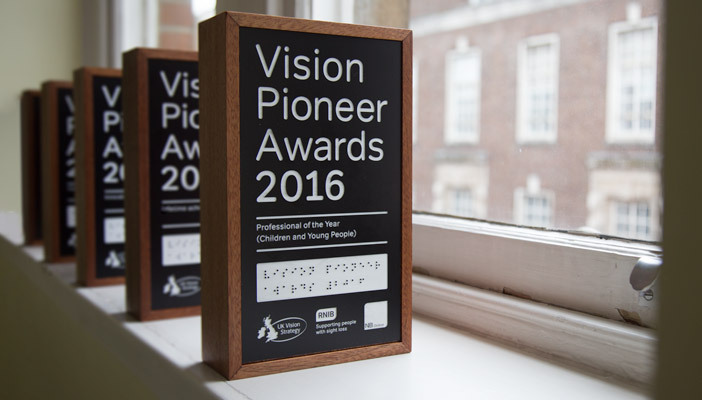 The Vision Pioneer Awards are dedicated to recognising professionals whose work is making a real difference to the lives of children, young people and adults with vision impairment across the UK. Jan Quinn, Young People's Coordinator at Sight Advice South Lakes, Paula Varney, Family Support Officer at Vista, and Debbie Wallace, Honours Student from the University of the West of Scotland, have been shortlisted for Professional of the Year (Children and Young People). St Vincent's School for Sensory Impairment is in the running for Team of the Year. John Patterson, Principal, said: “It is most exciting for the whole school that we have been shortlisted for the Vision Pioneer Awards. Our ultimate aim is to challenge high unemployment rates amongst visually impaired communities. All finalists have been invited to a prestigious ceremony at the Grange Tower Bridge Hotel in London on Monday 13 June 2016, where the winners will be announced. Created by NB Online and UK Vision Strategy, the awards aim to champion best practice, honour the achievements of teams and individuals who are committed to supporting people with vision impairment, and raise awareness of sight loss and the importance of quality eye care.